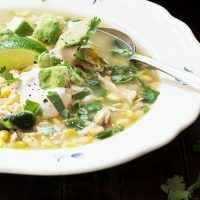 This Easy Rotisserie Chicken and Corn Soup starts with store-bought rotisserie chicken, for a quick, delicious and hearty soup. Served with a dollop of chipotle sour cream and fresh avocado. Happy Monday! 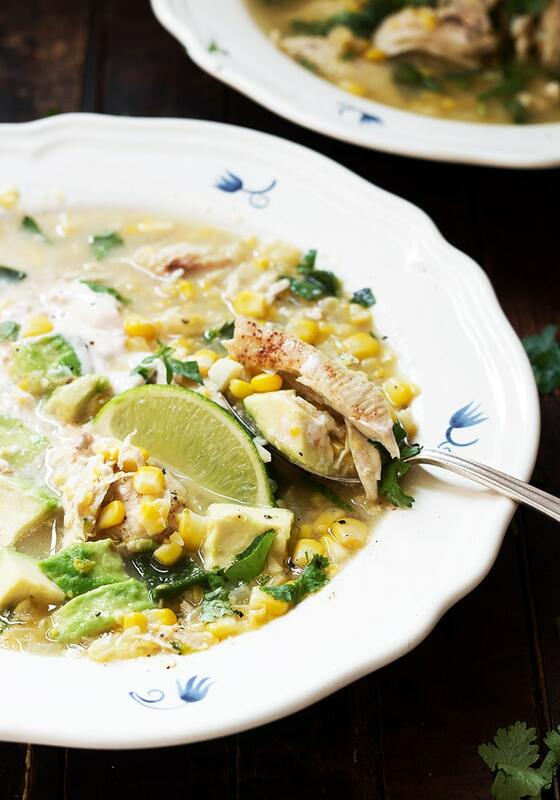 Wait … that’s definitely not a thing ;) So I’m hoping to make your Monday easier by offering up this Easy Chicken and Corn Soup, that starts with store-bought rotisserie chicken. Add in lots of corn (frozen in fine!) and some easy roasted poblano peppers, then serve it up with a dollop of chipotle sour cream, fresh avocado and lots of cilantro. It’s comforting chicken soup, meets fresh flavours! 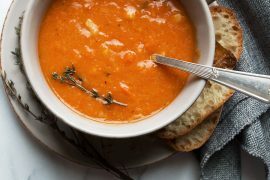 I love this soup for Fall, when we are not yet in to the deep freeze that seems to demand more of a chowder with potatoes and cream. This one doesn’t have any cream in the soup itself. Or potatoes, for that matter. Just lots of corn. 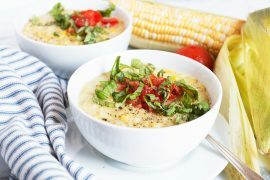 A bit of the corn is blended up, to offer a bit of a creamy texture, without need for added cream. That said, add on the chipotle sour cream and it will add a bit of creaminess (and flavour!) to the mix. Fresh lime juice, cilantro and fresh avocado keep this one light as well. 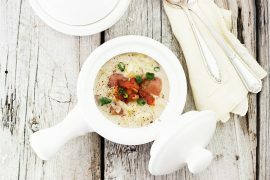 This soup offers up a ton of flexibility, so check out the Cook’s Notes below for those ideas. While starting with rotisserie chicken is easy and time-saving, if you have a couple of chicken breasts that need using and the extra bit of time, simply brush your chicken with olive oil, sprinkle with salt and pepper and maybe some chipotle chili powder and roast off in a 350F oven for 25-30 minutes, or until cooked through. Shred and use in the soup. Since it seems we’re only ever using a bit of that chipotle in adobo sauce, I like to freeze the rest in a small freezer bag. Be sure to label it (so you know what it is later ;), and then you can just cut off a bit from the freezer as you need those small amounts in future. 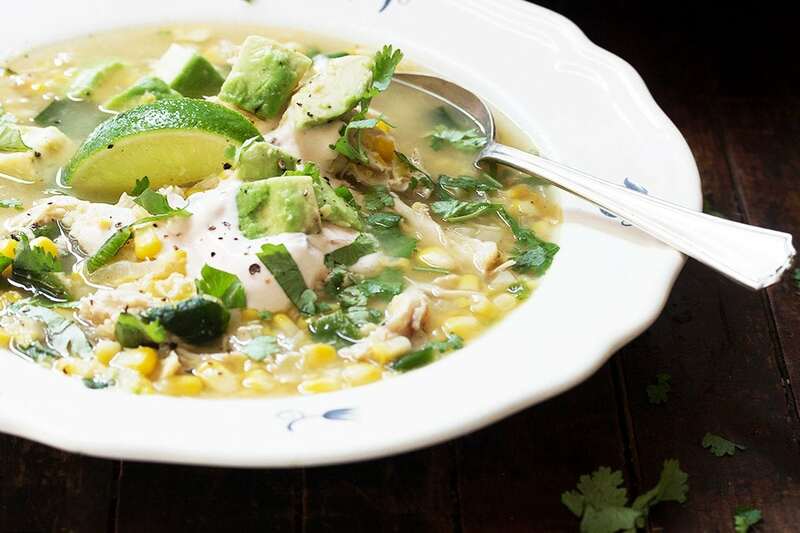 This soup uses lovely poblano peppers. Poblanos are larger, flat-ish dark green peppers that while sometimes labeled “hot” are not really, especially when roasted. I love the flavour. If you can’t find them, you can substitute Cubanelle (same shape as the poblano, but a lighter green/yellow-ish and a little milder) or just use regular old green sweet peppers. All roast up the same way. Hate cilantro? 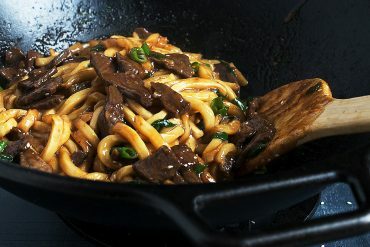 Skip it or substitute flat-leaf parsley instead. As for the chipotle sour cream, a bit of a note on that. If you are mixing it up to use right away, simply add as much of the chipotle as you like to your taste. So add a bit, taste, add, taste, etc. 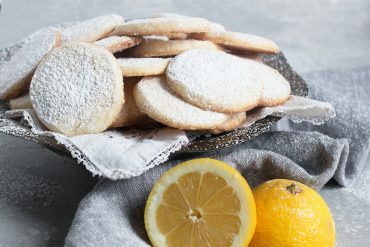 If you are mixing it up ahead and it’s going to sit, bear in mind that the flavour and heat will intensify as it sits, so add a bit less than you think you need. You can always add more later if you need to. 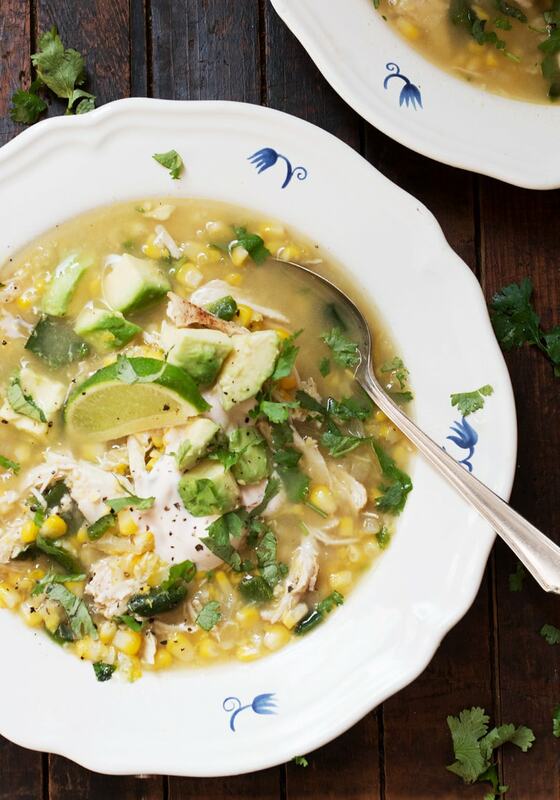 A delicious chicken and corn soup, made easy as it starts with store-bought rotisserie chicken (or roast up your own chicken if you prefer). Served topped with fresh avocado and cilantro. Preheat the oven broiler with a rack about 5 inches from the element. Cut the poblano chiles in half lengthwise and remove the stem and seeds. Place cut side down, on a baking sheet and broil until the skin blackens and blisters, about 4-5 minutes. Remove from the oven. Cover baking try loosely with aluminum foil and let stand for 10 minutes. Using the edge of a knife, peel away and discard the skin from the peppers, then cut them into 1/2-inch pieces. Set aside. In a large pot on the stovetop, heat the olive oil over medium-high heat. Add the onion and cook, stirring occasionally, until tender and translucent, about 3-4 minutes. Add the garlic and season with salt and pepper. Cook, stirring for an additional 1 minute. Add the chicken broth and bring to a boil. Stir in the corn and cook for 5 minutes. Using an immersion blender, puree about half of the soup, leaving some of the corn kernels whole. *If you don't have an immersion blender, remove soup to a blender or food processor and blend in small batches. Return to the pot and stir to combine. Stir in the cooked, shredded chicken and diced poblano chillies. Taste, then season with salt and pepper to taste. Keep warm over low heat while you prepare the chipotle sour cream. To make the chipotle sour cream, stir together the sour cream, chipotle chile and lime juice. Season with salt and pepper. Taste and add more chipotle, if you like, to taste. To serve the soup, divide the soup among 4 to 6 bowls. Top each serving with a dollop of the chipotle sour cream and diced avocado. Sprinkle with fresh chopped cilantro. NOTES: If you would like to cook your own chicken, start with 2 small boneless chicken breasts. Preheat oven to 375°F. Brush the chicken breasts with a bit of olive oil and season with salt and pepper. If you like, sprinkle with a bit of chipotle chilli powder or regular chilli powder. Place on a baking sheet and roast until opaque throughout, about 25 minutes. When cool enough to handle, shred the chicken and set aside. This soup is beautiful and tantalizing! And this is why it pisses me off so much when people say they have not time to cook. Including my daughter! I’ve even heard that rotisserie chicken from Sam’s is wonderful. Now that sounds like a very flavorful soup…love it. 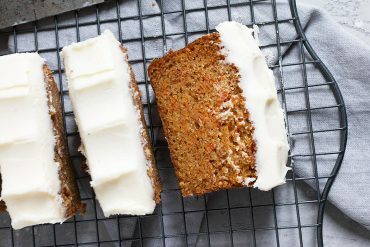 This looks and sounds incredibly delicious and perfect for the cooler weather. 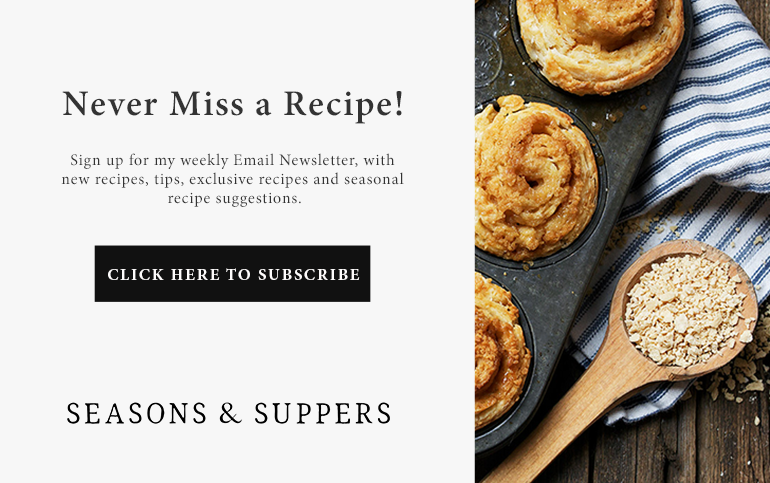 This soup sounds like the perfect addition to my Sunday meal prepping for the week ahead! Can’t go wrong with a hearty, healthy soup with lots of flavour! And I definitely love the idea of using a rotisserie chicken and saving time! Thanks Leanne and yes, love rotisserie chicken for a quick and easy meal! Must have this soup, Jennifer! Gotta love the ease of using a rotisserie chicken to create such a delicious dinner. Chiles, avocado and cilantro must make this truly pop in your mouth! I bet you leave out the cilantro, lol. We get a rotisserie chicken about once a week so I’m ready! Love the addition of the avocado and that chipotle sour cream! I bet this is delicious. Your soup is perfect for today Jennifer! It’s snowing again and we have tons of avocados and some fresh corn in the fridge. I will just have to cook up some chicken. I love the idea of the chipotle sour cream, will make some for extra heat on this cold day. Have a wonderful week! Yep – there was a definite shift in our weather yesterday making it a perfect time for this soup! Bring on the rotisseries! Love this Jennifer ~ we ALWAYS have a rotisserie chicken in the fridge, and this is a beautiful way to use it! What a healthy and delicious looking soup. Perfect for an easy weekday meal. I think rotisserie chicken are wonderful . It’s really cold here today, so I’m craving bowl after bowl of this delicious soup!! 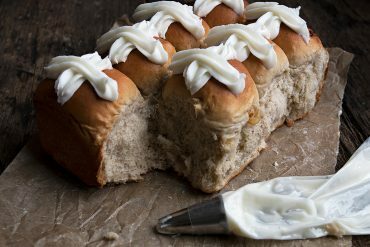 I love how easy this is, yet how jam packed with flavor!! Pinned! Cheers! I’m going the easy route and using the rotisserie chicken Jennifer! Nothing beats it. 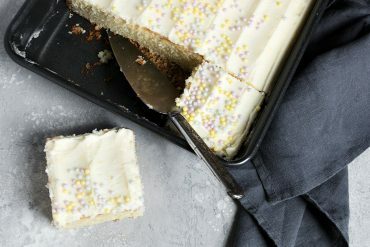 I love that you haven’t used any cream in this recipe, just the corn. Looks delicious and perfect for soup season!